Mrs. Bonnie Sue Cobb Payne, age 91, of Carnesville, GA, formerly of Toccoa, passed away Friday, March 29, 2019 at Brown Health and Rehabilitation. Born August 23, 1927 in Franklin County, GA, she was the daughter of the late Abraham Bunyon "A. B." and Fannie Lou Brock Cobb. She was a member of Rock Creek Baptist Church, was a homemaker, wife, mother and grandmother. 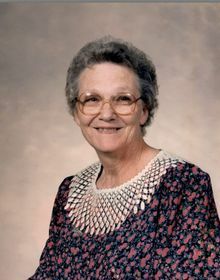 Bonnie Sue also worked at Wrights Manufacturing as a seamstress. Family members include her son and daughter-in-law, Sherman and Deborah Payne; grandchildren; Sonja Payne Greer, Clay Smith, Jeff Payne, Brad Payne, Joe Shelton, Brian Smith, Wes Payne, Pam Shelton, Cory Payne, Kyle Payne, Wade Dutton, April McKissick, Brandy Whitlock, and Jill Roberts; 23 great-grandchildren; 21 great-great-grandchildren; sisters and brother-in-law, JoAnn Ward and Bobby and Arvelene Griffin; and numerous nieces and nephews. She was preceded in death by her husband, George Lee Payne; sons, Dennis Payne and Haskell Payne; daughters, Daphene Barrett and Delores Shelton; brothers and sisters, Maryzell Outz, Roscoe Cobb, Champ Cobb, Ruth Day, Albert Cobb, and Helen Trotter; a great-granddaughter and a great-great-granddaughter. Funeral services will be held at three o'clock Sunday, March 31, 2019 from the Chapel of Whitlock Mortuary with the Rev. James Gunn and the Rev. Tim Griffin officiating. Burial will follow at Rock Creek Baptist Church with the Rev. Roger Elrod officiating at the graveside service. The following gentlemen will serve as pallbearers; Clay Smith, Jeff Payne, Brad Payne, Joe Shelton, Brian Smith, Wes Payne, Cory Payne, Kyle Payne, and Wade Dutton. The family will receive friends at the mortuary from 1pm until the service Sunday, March 31, 2019. Add Photos, Videos, Music that tell the story of Bonnie Sue's life.